Why Do You Raise Pigs? That was the question posed to Beth and me on our recent visit to Sanford Middle School in Minneapolis. Why do you raise pigs instead of crops or vegetables? Interesting question, one that made me think for a moment. I started to reply that it was part of our heritage. Dale’s grandfather and father had both been pig farmers, so it was natural for Dale to continue to do so. Heritage and tradition are a large part of agriculture and our family is no different. I also came from a hog farm so it seemed natural for me to be married to a pork producer. I also went on to explain that we really enjoy taking care of the animals. That was a common message throughout the whole day – things that Dale does to take care of the animals. I think people who don’t know much about agriculture – especially animal agriculture, really underestimate how much you have to care about animals to do it for a living. Why else would you stay up late or get up early to feed and take care of them? My answer seemed to satisfy her curiosity and I went on to address the other questions. Later, the teacher told me that particular student was a vegetarian and had been struggling a bit with her class adopting a pig farmer. Naturally I replayed my answer in my mind, wondering if I could have said something different, something better. When I asked the teacher about my response, she said it was just fine. Why do we raise pigs? Because deep down at the end of the day, after all the talk about productivity and profitability, it’s because we really like caring for animals. Me talking about pork, I really do love my job!! 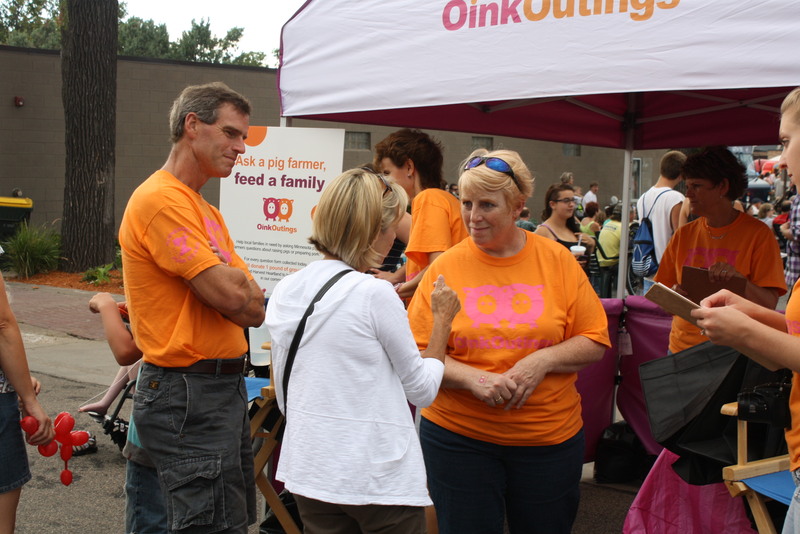 Hi, my name is Pam Voelkel, I work for Minnesota Pork Board and my job is to promote pork. My title is Director of Events, so I organize and find the different events that we participate in throughout the year. Grandma’s Marathon in Duluth was our first marathon where we had a booth to talk with runners about adding pork into their healthy lifestyle. I think the runners have actually started to wear off on me!! This year, my goal is to run the William A. Irvin 5K on Friday before the Grandma’s Marathon. This is a daunting task right now and I am beginning to wonder if I have bitten off more than I can chew…. I have tried to start with some pilates exercises, so far it is going pretty well. My 15 year old daughter has now decided she will begin walking/running with me. We are hoping the weather next week warms up enough for us to be able to get outside after school/work to start the training program.